This solution simple. Its time complexity is O(nlog(k)). The floor(x) method returns the greatest value that is less than x. 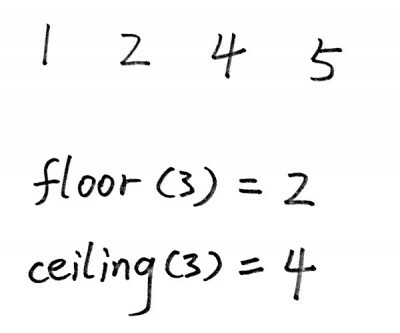 The ceiling(x) methods returns the least value that is greater than x. The following is an example. Isn’t sub.size() = O(k) ? So, O(n*k) not O(n*logk)? Looking to the Java 1.8.77 code: fromStart and toEnd are false, therefore it will iterate thu the set => linear. It seems to me this is linear. In the first case, Could overflow happend? In that case, ‘true’ must be returned before the snippet. I admire your excellent solution and posts. But I believe there is a possible pitfall for your first solution. This would wrongly delete the nums[i], if nums[i] and nums[i – k] have the same value. Using the above logic, when we reach i = 5. Thus the return for this input is false. Actually it should be true. Cause num = 1, num = 2 meet the requirement.